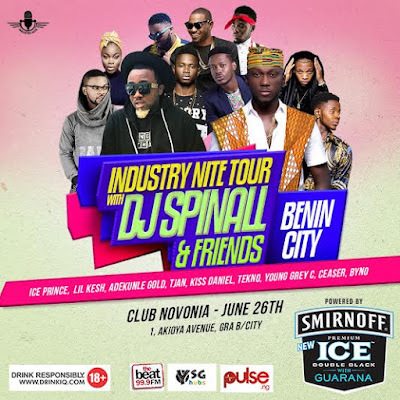 June 17th will forever be known as the day DJ SPINALL a.k.a TheCAP; was unveiled as the official DJ of the brand known for the best party experiences worldwide; Smirnoff. It really was the party of the year! Smirnoff is dedicated to giving consumers the best of party experiences so gear up for more awesomeness as the party train heads your way this Friday the 26th. Benin turn up! Its your time to experience a night like never before and its going down at the Club Novonia – 1 Akioya Avenue, off Oguigo Street, GRA by 10pm. So, if you’re in town, make it a date with Smirnoff and DJ Spinall and experience a #doubleside night like none other. Of course there will be the very best of entertainers in the building on that night and mind-blowing performances from celebrities like Ice Prince Lil Kesh, Adekunle Gold, Kiss Daniel, Tekno, Falz, Young Grey C, Tjan, and of course the unstoppable DJ SPINALL himself. You can keep in tune with updates and breaking news simply by following the hashtag #doublesideon Instagram - @SmirnoffNG, Twitter: @SmirnoffNG and Facebook: SmirnoffNigeria. Remember you have to be 18+ to party with Smirnoff.